Background: Metronidazole (MTZ) is a synthetic derivative of nitroimidazole that has been widely used for the treatment of several bacterial and parasitic infections including trichomoniasis, amoebiasis, giardiasis, liver abscess, gingivitis, syphilis and phagedena. Scientists have evaluated its carcinogenicity in preclinical in vitro and in vivo studies. Method: Google scholar and Pubmed search engines were used to construct historic timeline after discovery of MTZ with a journey of ~3 decades of research. Similar search was conducted for its in vivo carcinogenic activities, further extended to elaborate its role in carcinogenicity in humans. Results: In addition to preclinical in vitro validation of DNA damage, MTZ has been reported to induce cancer in a variety of animal models including lung cancer, malignant lymphomas, breast cancer, hepatocellular carcinoma, pituitary tumors, testicular neoplasms and uterine cancer. Several retrospective cohort studies have reported MTZ as a potential risk factor for lung cancer (n = 771), cervical cancer (n = 2500), breast cancer (n = 2), cholangiocarcinoma (n = 1), and neuroblastoma (n = 28). So far, all the reported data have confirmed MTZ carcinogenicity in animals; however it is still controversial in humans. Based on previous observations, the oxidative metabolites from MTZ are shown to have more carcinogenic effects than the parent drug itself. Conclusion: Due to potent carcinogenic behaviour, use of MTZ for animals’ treatment and its uses in animal food products is prohibited in USA and European countries; however its clinical use in human population is still increasing. Therefore, regular research studies are required to explicate its mechanism/s involved in carcinogenesis. 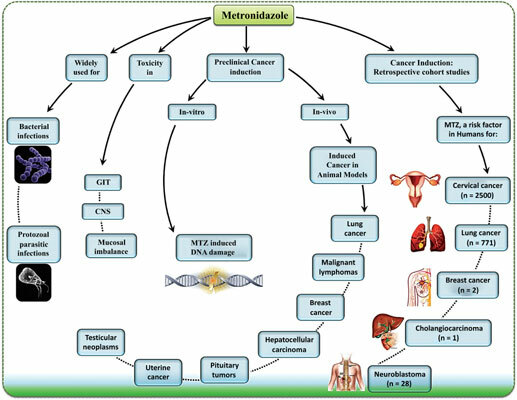 Keywords: Metronidazole, cancer, risk factor, preclinical, retrospective cohort analysis, oxidative metabolites, mechanism of carcinogenesis. Title:Association of Metronidazole with Cancer: A Potential Risk Factor or Inconsistent Deductions? Keywords:Metronidazole, cancer, risk factor, preclinical, retrospective cohort analysis, oxidative metabolites, mechanism of carcinogenesis. Abstract:Background: Metronidazole (MTZ) is a synthetic derivative of nitroimidazole that has been widely used for the treatment of several bacterial and parasitic infections including trichomoniasis, amoebiasis, giardiasis, liver abscess, gingivitis, syphilis and phagedena. Scientists have evaluated its carcinogenicity in preclinical in vitro and in vivo studies.